Students from INTI International University & Colleges proved their mettle when more than 20% of those taking the Cambridge A Level Examinations (A2) received 3As and above, with five students receiving 4A* (4 A stars) – the highest grade awarded by Cambridge. More than 120 students sat the examinations across INTI’s Subang, Nilai and Penang campuses, with the following students being awarded the 4A*: Soffi Law Kei Kei and Tan Zhi Qi from INTI Subang; as well as Hwong Lee Ho, Lim Jia Yi and Gan Evelyn from INTI Penang. 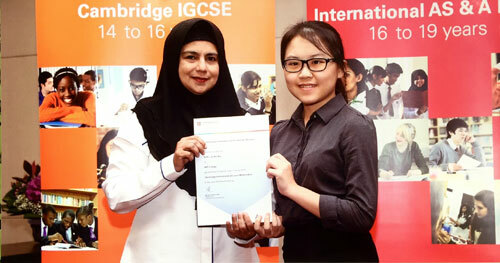 Soffi Law from INTI Subang receives the award for Top in the World for Cambridge AS Mathematics. In addition to receiving these outstanding results, Evelyn, aged 20 and Soffi, aged 19, also previously earned the Top in the World Award for AS Mathematics, each achieving the highest marks in the subject from among thousands of candidates worldwide. 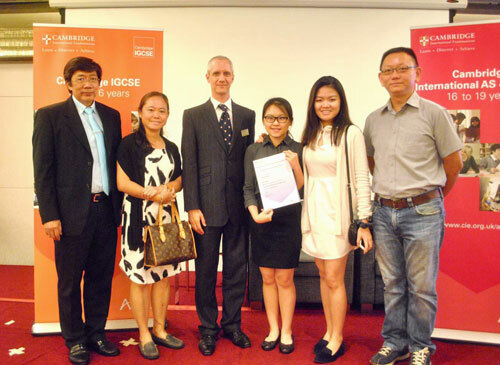 The Top in the World award is an annual recognition which is part of the Cambridge Outstanding Learners Awards and INTI students have consistently bagged the title over the years in a number of subjects including Mathematics, Physics and Law. Evelyn, who aspires to pursue a UK Degree Transfer Programme to read Law upon completing her A Levels shared, “While completing the programme within a year and a half seems like a rush, my formula for success is always to strive hard and never be afraid to ask questions. Throughout my studies, I made it a point to constantly approach my lecturers to clear my doubts and was grateful to be able to connect with them through various platforms, including emails, messages and even Facebook. Having my lecturers close at hand even after classes helped me to understand the subjects better.” A former student from SMK Methodist (A.C.S.) Kampar who hopes to study Pharmaceutical Chemistry, Soffi expressed her gratitude for receiving the INTI Leadership X-cellence Scholarship, an award to students who demonstrate strong leadership qualities and have actively served in their schools and community. In addition to the financial aid, Soffi was also thankful to her lecturers who not only taught their subjects but also instilled a number of positive values in the students during the programme. Soffi Law (third from right) with proud parents and representatives of the Cambridge Learners Awards. “INTI emphasizes holistic learning and encourages students to participate in a variety of programmes which will help us to develop our skills and capacities. During my studies I participated in the Euclid Mathematics Contest, receiving the 4th Runner Up title; and the IMU Science Discovery Challenge in Chemistry. Both of these competitions were opportunities for me to put my knowledge to the test against other competitors and helped me to improve my understanding immensely,” said Soffi. INTI’s established Cambridge A Level curriculum provides a solid foundation of fundamental knowledge and prepares students for their progression into international tertiary programmes. Assessments are based on students’ mastery of subjects and their ability to apply their learning in real world scenarios. Through the dedicated efforts of its experienced faculty and access to global resources, INTI students are assured of a pathway to global success both in their choice of universities and future employment.